Some of the drawings are hard to decipher, so is not easy to make some of the models.Some steps are so difficult need more drawings to elucidate the evolution of the fold.A good intro. Beware! This is a book by Robert HarbinNO David Brill!!! This book is the same as "Teach Yourself Origami" and "Origami, the Art of Paper-Folding", just with another cover to make you think it is new, also in the webside they describe it as a book of David Brill, it does not contain nothing of him, not even his name mention!?!? 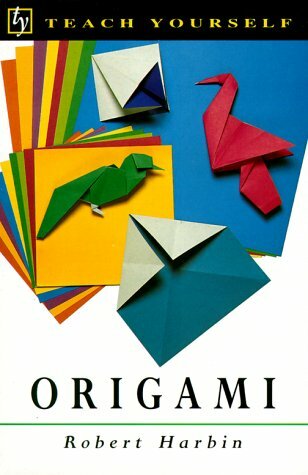 Years ago I had a wonderful beginner's origami book by Robert Harbin called "Paper Magic".I lent it to a friend and never saw it again.I spent years... nae decades... searching for a replacement. Imagine my joy when I received "Teach Yourself Origami" and found it to be the same book with a different title!The same logical progression, good illustrations with clear directions, and simple but charming models... it was like seeing an old friend. Even the more advanced folder will find these models rewarding and for introducing a friend, even (or especially) a child, I have found none better. Great illustrations and good instructions. Easy to comprehend. This book is nice because it teaches you the universal signs of different paper folds. This helps when you come across a fold you don't immediately recognize in another book. A fun place to start. I've had a copy of this since it came out in 1969, and it has some of my favorite models.Years ago I made a mobile with the fish model and was pleased enough with the results to repeat it several times for friends.Although I've since progressed to other books which I like even better, I still treasure this one because of it's clear diagrams, gradual build up of skills, and delightful imagination. This book is "Step 1". I originally began with "the Great Origami book & kit", but ... that book is too advanced for beginners. It does offer, I believe, the best "Step 2" option to follow on your journey to master this ancient art form, but begin with THIS book. It is more detailed that most origami books and leaves out no steps to the intricate folds you must master to proceed to the next (series of fold). The folds are very difficult for beginners and this book proceeds very slowly going over each and every tiny movement your hands must make. With origami..there can't be ANY mistakes. It is about perfection. If you are a fraction of a millimeter off on a fold, your product will not turn out professionally. I also recommend taking what I joke as "stress breaks" while proceeding. Many times I have become too frustrated, only to walk away from my project and return to see the mistake I made. My second tip is to BREATHE..the paper will not harm you, although at times you feel it's torture. Use this book and follow it up with a great kit like the one I previously mentioned...you will have two steps (a beginner and more advanced kit) for making a litter of cute creations.